Perennials; glabrous or sparsely pubescent distally. Rhizomes (tuberous at stem base, sometimes also at intervals) subglobose, lobed, 4-15 mm diam. (fleshy). Stems erect, unbranched, (1-)2-6 dm, glabrous or sparsely pubescent on distal 1/2 (trichomes 0.02-0.1 mm). Rhizomal leaves simple, (2-)4-13(-16) cm; petiole (1.5-)2.5-10(-13) cm; blade usually reniform to cordate or ovate, rarely oblong, (1-)2-4(-6) cm, base obtuse to cordate, margins usually repand or entire, rarely shallowly dentate. Cauline leaves (2-)4-10 (-14), simple, petiolate or sessile; (middle ones) shortly petiolate or (distally) sessile, base not auriculate; blade ovate to oblong, or oblong-linear to lanceolate, 3-6(-9) cm × 10-30(-45) mm, margins entire, repand, or dentate (margins minutely pubescent). Racemes ebracteate. Fruiting pedicels ascending to divaricate, (10-)15-22 (-30) mm. Flowers: sepals oblong, 2.5-4.5 × 1.5-2 mm, lateral pair not saccate basally, (glabrous); petals usually white, rarely pale pink, obovate, (6-)7-12(-16) × 3-5 mm, (short-clawed, apex rounded); filaments: median pairs 4.5-7 mm, lateral pair 2-3.5 mm; anthers oblong, 1-1.5 mm. Fruits linear, 2-3.5(-4) cm × 1.4-1.7 mm; ovules 14-24 per ovary; style 2-4(-5) mm. Seeds dark orange to greenish yellow, oblong or globose, 1.7-2.1 × 1-1.4 mm. 2n = 16, 56, 64, 80, 96, 112. Flowering Mar-Jun. Wet grounds, low woodland, moss hummocks, alluvial woods, grassy floodplains, wet pastures, meadows, pinelands, creek bottoms, stream banks, sandy bottoms, ditches, mesic or wet forests, swamps, marshes, seepy bluffs; 0-900 m; Man., Ont., Que. ; Ala., Ark., Conn., Del., D.C., Fla., Ga., Ill., Ind., Iowa, Kans., Ky., La., Maine, Md., Mass., Mich., Minn., Miss., Mo., Nebr., N.H., N.J., N.Y., N.C., Ohio, Okla., Pa., S.C., S.Dak., Tenn., Tex., Vt., Va., W.Va., Wis.
Perennial herb 20 cm - 0.6 m tall Stem: upright, branched or unbranched, green, purplish near base, mostly hairless. Flowers: in rounded, branched clusters, white, 7 mm - 1.5 cm wide. Sepals four, green, turning yellowish with age. Petals four, much longer than sepals. Stamens six. Fruit: a narrow pod, upright, ascending to diverging, 1.5 - 2.5 cm long, lance-shaped, somewhat flattened, with a 2 - 4.5 mm beak. Rhizome: short, stout, tuber-like, barely subterranean. Lower leaves: alternate, long-stalked (purplish), 2.5 - 5 cm long, 2.5 - 3 cm wide, oval to egg-shaped to roundish, base tapering to truncate (cut straight across), slightly wavy along the margins, sometimes hairy. These leaves usually fall off before the plant begins to flower. Upper leaves: alternate, mostly stalkless, smaller than basal leaves, oblong to lance-shaped, sometimes coarsely toothed, sometimes hairy. Similar species: The similar Cardamine pratensis and C. pratensis var. 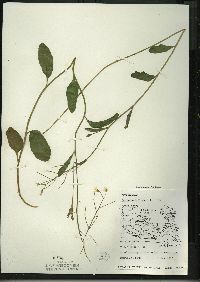 palustris differ by having pinnately divided leaves. Cardamine douglassii differs by having mainly hairy stems, pink or purple-tinged flowers, and sepals that turn purplish. Also, the blooming period of C. douglassii ends by mid-May. 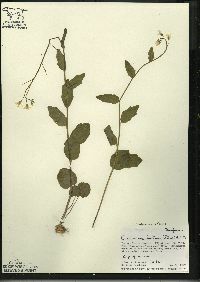 Other Cardamine species will have petals less than 7 mm long. Habitat and ecology: Typical of calcareous fens, but also found in moist woods and floodplains. Also grows along roads, rivers, creeks, and other wet areas. Etymology: Cardamine comes from the Greek word kardamon, which refers to plants in the cress family. Bulbosa means bulbous. Frequent to common throughout the state in low places in woodland, marshes, ditches, and springy places along streams and in wet places about ponds, sloughs, and lakes. This species seems to find its optimum in the inundated woods of the southwestern part of the state where branched specimens are more frequently found. This species, as well as the next, varies in the amount of pubescence. It is generally slightly pubescent near the base only but specimens are found which vary from entirely glabrous (with the exception of a straggling hair here and there) to pubescent up to the middle. Extremely pubescent plants, however, may be albino forms of the next species if we accept this form. Rarely a plant is found that is glabrous except for a pubescent calyx.